The IRA's announcement that the armed campaign is over is the latest in a series of key statements by the organisation. The timeline charts these declarations since the Good Friday Agreement in 1998 to the present day. It reflects the organisation's movement on decommissioning from a position in April 1998 when the IRA said there would be none, to October 2001 when the first weapons were put beyond use. It also charts the IRA's reponse to the collapse of various political deals and in 2005 its "internal inquiry" into the killing of Robert McCartney outside a Belfast bar. The first crucial statement on how it would act following the Good Friday Agreement came on 30 April. The agreement, said the IRA, "clearly falls short of presenting a solid basis for a lasting settlement". But it added: "The Good Friday document does mark a significant development. But whether or not this heralds a transformation of the situation is dependent totally on the will of the British government. "Accordingly, we will carefully monitor the situation." On decommissioning, the IRA said: "The IRA commitment to assisting the search for justice and peace is a matter of public record. "This commitment remains. "Let us make it clear that there will be no decommissioning by the IRA. "This issue, as with any other matter affecting the IRA, its functions and objectives, is a matter only for the IRA, to be decided upon and pronounced upon by us." Attempts to set up the Northern Ireland Assembly failed because unionists refused to sit in the administration with republicans without prior decommissioning by the IRA. Those who demand the IRA decommissioning lend themselves in the current context to the failed agenda which seeks the defeat of the IRA. "The argument that the present political process can deliver real and meaningful change has been significantly undermined by the course of events over the past 15 months. "We have contributed in a meaningful way to the creation of a climate which would facilitate the search for a durable settlement. "Those who demand the decommissioning of IRA weapons lend themselves in the current context inadvertently or otherwise to the failed agenda which seeks the defeat of the IRA. "The British Government has the power to change the context and should do so." Following the Mitchell review of the peace process, the parties made another attempt to find a way forward. As the deadline for a deal came closer, it became clear that all parties to the agreement were being urged to give ground on key issues as part of a carefully sequenced train of events. The IRA's part in this would be to commit a representative to negotiations with John de Chastelain, the Canadian general overseeing decommissioning. "The IRA is willing to further enhance the peace process and consequently, following the establishment of the institutions agreed on Good Friday last year, the IRA leadership will appoint a representative to enter into discussions with General John de Chastelain and the Independent International Commission on Decommissioning." Days after agreement over the assembly was reached, the IRA confirmed that a representative had met General de Chastelain. By February 2000, First Minister David Trimble was preparing to make good on his threat to resign because of no movement on arms by the IRA. The IRA's subsequent statement attacked the Northern Ireland Secretary for accusing it of betrayal over decommissioning. "We have never entered into any agreement or undertaking or understanding at any time whatsoever on any aspect of decommissioning," it said. "We have not broken any commitment or betrayed anyone. It is the IRA who took the first step to remove the guns from Irish politics by silencing weapons. "Those who have once again made the political process conditional on the decommissioning of silenced IRA guns are responsible for creating the current difficulties and for keeping the peace process in a state of perpetual crisis." On 11 February the Secretary of State suspended the assembly to prevent its collapse. Four days later the IRA issued another statement announcing that it had cut ties with the independent decommissioning body. Despite public deadlock, negotiations continued behind the scenes to restore devolution. Those negotiations led to a proposed sequence of events which envisaged a return to power-sharing linked to a firm IRA commitment to decommissioning. In turn, any IRA action would, it appeared, be dependent on British movement on policing reform and demilitarisation. On 6 May the IRA made an unprecedented statement that independent international inspectors would be allowed in to some of its arms dumps. "The IRA leadership is committed to resolving the issue of arms. "The full implementation, on a progressive and irreversible basis by the two governments, especially the British government, of what they have agreed will provide a political context, in an enduring political process, with the potential to remove the causes of conflict, and in which Irish Republicans, and Unionists can, as equals pursue our respective political objectives peacefully. "In that context, the IRA leadership will initiate a process that will completely and verifiably put IRA arms beyond use. "We will resume contact with the Independent International Commission on Decommissioning and enter into further discussions. "There is no threat to the peace process from the IRA. "In this context, the IRA leadership has agreed to put in place, within weeks, a confidence-building measure to confirm that our weapons remain secure. "The contents of a number of our arms dumps will be inspected by agreed third parties, who will report that they have done so to the Independent International Commission on Decommissioning. "The dumps will be re-inspected regularly to ensure that the weapons have remained silent." David Trimble narrowly won the support of his party and devolution was restored. On 26 June the IRA confirmed that the international inspectors had examined arms dumps. With the political process stagnating, the IRA issued a statement reiterating its May position and reviewing what it thought had happened since then. It accused the British government of not honouring its side of the bargain. In contrast, unionists said no guns had been destroyed and contact with the decommissioning body had been minimal. "On May 6 in a considered statement we provided a clear and reasonable context in which this could take place. "It cannot and will not happen on terms dictated by the British government or the unionists. "We have not broken off contact with the IICD and we remain committed to discussions with them on the basis we have set out. "The political responsibility for advancing the current situation clearly lies with Tony Blair who must honour all commitments. The IRA has honoured its commitments and will continue to do so." Despite hopes of a breakthrough in January and February 2001, the parties and the governments failed to make headway on the outstanding issues of the peace process - policing reform, decommissioning and a scaling down of the British army's presence. On the day that Tony Blair and his Irish counterpart Bertie Ahern arrived to hold all party talks, the IRA released a statement setting out its response to the "intensive negotiations" that had been taking place. The IRA said that it blamed the British government for failing to meet its obligations on policing and criminal justice reform, human rights and equality. But it said that it was willing to enter into "further discussions" with the decomissioning body on the basis of what it set out in its statement of 6 May 2000. "For this engagement to be successful the British government must deliver on its obligations," said the statement. In its Easter statement, the IRA reiterated that it was committed to seeking a "permanent peace" in Ireland - but that there should be no attempts by the British government to renegotiate the terms of the Good Friday Agreement of 1998. The statement came after the IRA re-engaged with the international decommissioning body and had used the contact to set out what it saw as the basis for discussion of the arms issue. The head of the decommissioning body, Canadian General John de Chastelain said that he believed that the contact had been made "in good faith". In its statement, a week before the general election, the IRA said that it had held four meetings with the arms decommissioning body - and that a third visit to arms dumps had been carried out by international independent inspectors. The IRA said that it had honoured every statement it has ever made - and called on others to do the same. Sinn Fein said that the continuing meetings showed how much progress had been made; unionists criticised the statement for offering no real progress. In a seven-sentence statement, the IRA confirmed that it had agreed a scheme to put arms completely and verifiably beyond use. The statement confirmed an earlier one from the international arms decommissioning body outlining that agreement had been reached. The statement fell short of unionists demands for evidence that decommissioning had actually begun. But the IRA said that it noted "ongoing attempts in some quarters to prevent progress. They should not be permitted to succeed." With the unionists having rejected the IRA statement of 9 August, Northern Ireland Secretary John Reid suspended the devolved institutions for one day to trigger another six-week negotiating period. That sparked fury among nationalists - with republicans accusing the British government of having pandered to the unionists. Less than a week after widespread speculation that decommissioning could begin, the IRA issued a new statement, withdrawing the offer it had put before General John de Chastelain. It said that its offer had been "an unprecedented development which involved a very difficult decision by us and problems for our organisation". But it continued: "The outright rejection of the IICD statement by the UUP leadership, compounded by the setting of preconditions, is totally unacceptable." Two days before the deadline for solving the political crisis, the IRA released a statement saying that it was "intensifying" its engagement with the decommissioning body. It said that it wanted to accelerate the moves towards a "comprehensive resolution" but that depended on others playing their part, principally the British government. Referring to the arrest of three suspected IRA members in Colombia, the statement said that it had not sent anyone there to train or militarily engage with any group. After months of stalemate, the IRA announced that it had finally begun a process of decommissioning. In a statement issued at 1700 GMT after two days of rising expectations, the IRA said that it had undertaken this move to "save the peace process" and "to persuade others of our genuine intentions". After weeks of expectation, the IRA announced that it had put a second tranche of weapons "beyond use". It described its action as unilateral and insisted that the onus was on the British government and unionists to make the peace work. For years people had demanded that the IRA should apologise for its actions. On the eve of the 30th anniversary of the Bloody Friday bombings in Belfast, the IRA expressed its "sincere apologies and condolences" to victims who had been "non-combatants". "There have been fatalities amongst combatants on all sides. We also acknowledge the grief and pain of their relatives. "The future will not be found in denying collective failures and mistakes or closing minds and hearts to the plight of those who have been hurt. "That includes all of the victims of the conflict, combatants and non-combatants." In the wake of the devolution crisis in early October and calls for the IRA to disband, the organisation issued a statement announcing that it was suspending talks with the decommissioning body. "The British government says that responsibility for this present crisis and its resolution lies with us," said the statement. "At the same time the British government, by its own admission, has not kept its commitments." 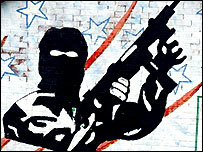 In its New Year statement, the IRA leadership said the Northern Ireland political process was "under threat". It came against a backdrop of further talks with the province's political parties aimed at restoring devolution. The Northern Ireland Assembly has been suspended since 14 October following a row over allegations of IRA activity, including intelligence gathering at Stormont. The IRA also accused both the British government and unionists of trying to impose "'unacceptable and unrealistic" demands on republicans. However, the group said it "remained committed to a just and lasting peace". The IRA endorsed a statement made by Sinn Fein President Gerry Adams earlier in the day. It said its leadership was committed to "resolving" the weapons issue. "In line with our stated position, we have authorised our representative to meet with the IICD with a view to proceeding with the implementation of a process to put arms beyond use at the earliest opportunity. "We have also authorised a further act of putting arms beyond use." The Assembly elections of November 2003 had further strengthened the electoral hands of both Sinn Fein and the DUP. They were now the two parties expected to make any new deal despite their bitter enmity. In its Easter message the IRA argued that its guns "remain silent despite an onslaught of unionist paramilitary violence against Catholics" over the last year. It said it had fulfilled the agreements made and "commitments given" in October 2003. It accused the two governments of failing to fulfil their responsibilites. "They acted in bad faith. Yet again the two governments are attempting to move the goalposts." It would be September before any major new talks on the future of Northern Ireland would take place. By now Sinn Fein and the DUP had come within a whisker of forging an historic agreement. Following key talks at Leeds Castle in September involving all the main parties, delicate negotiations had continued between the DUP and Sinn Fein. These had been conducted through the two governments rather than face-to-face. These talks eventually foundered on the issue of whether photographic evidence would be made available in the event of full decommissioning. In its statement the IRA said: "For his part, Ian Paisley demanded that our contribution be photographed, and reduced to an act of humiliation. "This was never possible. Knowing this, he made this demand publicly as the excuse for his rejection of an overall agreement to create a political context with the potential to remove the causes of conflict." The statement went on: "We restate our commitment to the peace process. But we will not submit to a process of humiliation." There was no hoped-for Christmas breakthrough. The process went into deep freeze again and then was plunged into crisis as the Northern Bank's headquarters in Belfast were robbed on 20 December. A massive £26.5m was seized by the armed gang. Within days the IRA was blamed despite its denials. Politicians angrily denounced Sinn Fein for being in political negotiations while the robbery was being planned. Republicans continued to insist the IRA was not responsible. By now republicans were fire-fighting on several fronts. As the repercussions of the Northern Bank raid continued to affect the political process, the murder of a man outside a Belfast bar made the headlines in January 2005. Robert McCartney was killed on 30 January after he and a friend were involved in a fight with other customers who had returned from a Bloody Sunday commemoration. The IRA would later be forced to admit some of its members were involved after it became apparent that a forensic clean-up operation had taken place and witnesses had been ordered to keep silent by the killers. In early February, the IRA said it was withdrawing the offer it had put forward during the political talks. "In 2004 our leadership was prepared to speedily resolve the issue of arms, by Christmas if possible, and to invite two independent witnesses, from the Protestant and Catholic churches, to testify to this. "These significant and substantive initiatives were our contributions to the peace process. "Others, however, did not share that agenda." The IRA statement was bitterly critical of the Irish and British governments and of the DUP and stated baldly: "We are taking all our proposals off the table." The Robert McCartney murder continued to be a huge embarrassment for the Republican movement as Robert's sisters and partners mounted a high profile campaign to bring those responsible to justice. An IRA statement said: "Following our investigation the IRA leadership, along with the leadership of the Belfast Command, initiated disciplinary proceedings through Court Martial. "The outcome of the Courts Martial include the dismissal of three volunteers, two of whom were high ranking volunteers." The IRA statement had little impact on the campaign to bring witnesses to Robert McCartney's murder forward. The McCartney family continued to keep the pressure on republicans in the days that followed. As the public pressure mounted on republicans to co-operate with the murder investigation into the death of Robert McCartney, the IRA released a further statement. The five page document gave details of the organisation's internal inquiry into the killing and some detail on a meeting which had been held between its representatives and the McCartney family. But there was outrage at the paragraph on the third page where the IRA "stated in clear terms that the IRA was prepared to shoot the people directly involved in the killing of Robert McCartney." The statement made it clear that the McCartney family "did not want physical action taken against those involved. "They stated that they wanted those individuals to give a full account of their actions in court." After this statement the McCartney family's campaign continued and became more intense. They were invited to attend the St Patrick's Day celebrations in the White House. Unlike in recent years, Northern Ireland's politicians were left out of the occasion. In its Easter message the IRA again reiterated its position in relation to the killing of Robert McCartney. "It was wrong, it was murder, it was a crime. But it was not carried out by the IRA, nor was it carried out on behalf of the IRA. "The IRA moved quickly to deal with those involved. We have tried to assist in whatever way we can. "Unfortunately, it would appear that no matter what we do it will never be enough for some." The republican movement was still under ferocious pressure over the murder and the Northern Bank raid. Among those leading scathing criticism was the Irish Justice Minister, Michael McDowell. The peace process remained in stalemate and it was accepted that there would be no movement ahead of a spring general election which was anounced for 5 May. During the first week of the campaign, Sinn Fein President Gerry Adams made an appeal for the IRA to "fully embrace and accept" peaceful means and to allow politics to move the process forward. An initial statement from the IRA said it was giving "due consideration" to the appeal and Gerry Adams later said the IRA had begun its process of consultation. The Westminister and local council election results showed an increase in both Sinn Fein and the DUP's vote. Sinn Fein's Conor Murphy took the Newry and Armagh seat from the SDLP. The DUP won four more seats at Westminster including that of the Ulster Unionist leader David Trimble. Mr Trimble announced his resignation and blamed republicans and the two governments for the impasse in the process. The leadership of Oglaigh na hEireann has formally ordered an end to the armed campaign. This will take effect from 4pm [1600 BST] this afternoon. Volunteers must not engage in any other activities whatsoever. The IRA leadership has also authorised our representative to engage with the IICD [Independent International Commission on Decommissioning] to complete the process to verifiably put its arms beyond use in a way which will further enhance public confidence and to conclude this as quickly as possible.